In a couple of hours I’m meeting with our local Primary Mental Health Worker from a sub-team of the Child and Adolescent Mental Health Service (CAMHS). This is following a referral from our GP, and was only arranged at the start of the week. I appreciate this is just a first assessment, and is without Mini present, but I feel quite positive about this. The GP was the first step, a different angle was speaking with the school nurse. This feels like the second step, which means this train has officially left the station! I’m not really sure what to expect, or how to prepare, or even if I should prepare. But I have a list of Mini’s behaviours, which although not exhaustive, will give an idea of life with him. The thing is – how to do you know what’s relevant? Part of the reason it’s taken me so long to take advice and investigate Mini’s behaviour more is because I’ve spoken to friends and family who have convinced me he’s a typical child or have misunderstood what I’m telling them, or at least the severity of it. If you mention that Mini is defiant (oh yes, my son is the same), Mini screams when you say no (oh yes, well all children do that), Mini is sensitive to loud noises and still scared of the hoover and hand dryers (Yes, our daughter’s like that too), Mini wets himself regularly (well, they all do that sometimes don’t they), Mini can’t stand silence (No, mine are so noisy too), Mini likes to control conversations (oh all kids do that), Mini cannot cope without routine (well, we’re all creatures of habit), Mini has meltdowns (oh, mine too, it’s because they’re tired after school). It becomes all too easy to believe that your child is behaving the same as others. When you start putting all of these things together, and experience them to the extreme, well, life becomes really difficult, and along with all the other things he does and doesn’t do, you start to see a problem. I’ve been reading a bit more about attachment disorder – revisiting the things we read and looked at during our homestudy all those years ago, and I’m reminded of some things that Mini does that it hadn’t previously occurred to me to mention because I didn’t know they were unusual and because I had no idea what sort of problem we might be dealing with. 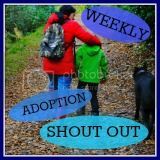 I’m not saying I do now, but after a little research and some comments and tweets from other adopters, it feels like a starting point. So now I’m adding to my list: Mini isn’t just noisy – he makes repeated noises – not words, although sometimes he gets fixated on phrases too, but just silly noises again and again. When he plays (which isn’t all that often, but getting more frequent) it’s always about putting people in prison, killing enemies – he is the police/superhero/strong figure, and focusses on beating the baddies. Mini has ‘treasures’ - items that are special to him, important because of where or who they’re from, favourite toys – but he doesn’t afford them the amount of care they deserve, if anything they are less well looked after than his other toys. It takes a very long time for Mini to learn a new routine effectively. Mini is a sore loser, he cannot cope with losing and will adjust the rules of a game (several times if necessary) to ensure he wins. He cannot take the blame for things – even minor things, and he will blame anyone else – in fact today Mini tried to blame 21month old Dollop for writing his name on the furniture…quite clever as Dollop can’t even hold a pencil without it ending up in her mouth, and can’t draw a circle let alone letters! These are the things I’ll be discussing soon. I’m nervous. What if they don’t think there is anything wrong? What if I’m seeing problems that aren’t there? What if all 5 year olds really are like this? I shall report back when I know more…. I hope that you are able to get some answers. You have to trust your instinct I think otherwise you can explain away all sorts of things. Good luck! Just been reading this Stix and it occurred to me that although a lot of the behaviours you are experiencing are undoubtedly down to Mini being adopted and struggling to find his place within the family unit, but I wondered whether any other additional possible causes have been discussed. I had the same problem as you with people telling me that youngest daughter's behaviour wasn't that bad or worse still having the finger of blame pointed at me and my parenting skills! Trust your instincts always until you get the answers you need.